First the effectiveness of the Spilanthol contained in Biotulin was tested under laboratory conditions using a muscle contraction model (NO animal testing!). Then, the same test was repeated on human study participants. Even the tiniest amount of Spilanthol is enough to completely relax the muscles beneath the skin treated. The subsequent trial on the human guinea pigs (also using a minute amount of the formula) confirmed the results already obtained from the muscle contraction model: within just 60 minutes after applying Biotulin Supreme Skin Gel the skin became as smooth and tighten as after Botulinum Toxin injections. Furthermore, with a Spilanthol concentration of even only three per cent, a residual effect could be still be observed 24 hours after application. After just 30 days of continual use, both the depth and length of wrinkles showed a marked reduction – skin was generally smoother and firmer. 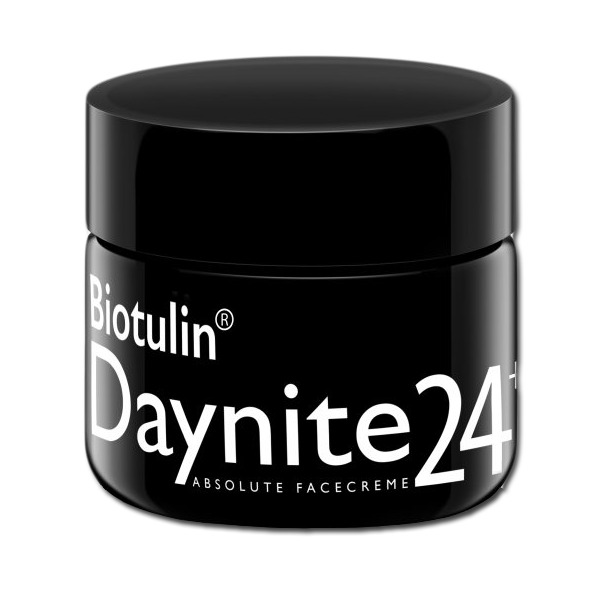 Daynite24+ is a day and night anti-wrinkle creme providing perfectly coordinated basic care for every skin type and age. Dermatological studies have shown that the Biotulin active ingredient combination reduces wrinkle depth by up to 25% within just one hour. Daynite24+ provides the skin with moisture and vitamins during the day. The light consistency does not create any ugly shine, your usual make-up can be easily applied after morning use of Daynite 24+. At night, Daynite24+ regenerates the skin due to natural grape seed oil. During development, particular emphasis was placed on the nourishing properties of individual active ingredients. The skin is optimally supplied by hyaluronic acid, ideally stimulating the skin's own collagen formation.